Damascus, SANA –Jaish al-Islam terrorists resumed on Saturday targeting the residential neighborhoods of Damascus. 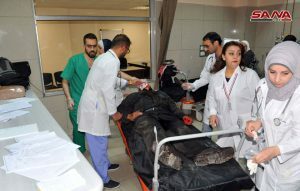 The number of injured civilians rose to 37, including women and children, while other eight civilians were martyred; including a child, not to mention the material damage to the houses, and private and public properties as a result of the terrorist attacks. 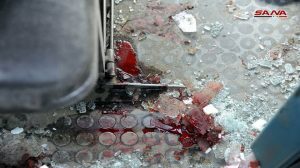 A source at Damascus Police Command told SANA that the terrorists of Jaish al-Islam fired 3 shells on Saturday afternoon on the neighborhood of Mazzeh 68, injuring 5 civilians, some of them having sustained serious injuries. Director General of al-Mouwasat Hospital, Dr. Issam Zakarya al-Ameen, said that the ER in the Hospital received on Saturday morning six bodies of martyrs of civilians including a child and 32 injuries, 10 of them suffered serious injuries, including amputation of limbs and cases of paralysis due to spine injury and severe injuries to the face and abdomen. 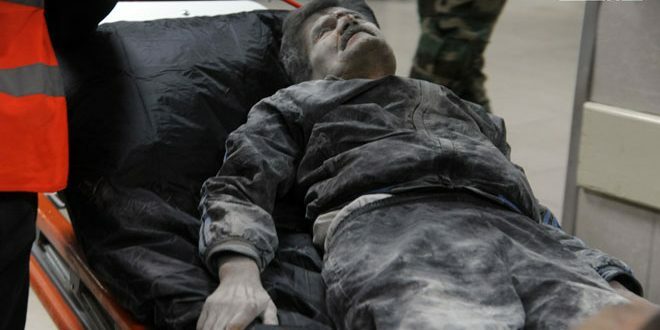 Earlier, the source mentioned that terrorists of Jaish al-Islam fired 7 mortar shells on Mazzeh 86 neighborhood and on the surroundings of the Umayyad Square and on Abu Remmaneh and Ish al-Warwar areas, leaving four civilians martyred and more than 30 others injured. Material damage was caused to the Islamic Radio and Television Union’s office in Mazzeh area due to the shells fired by Jaish al-Islam terrorists on Damascus. Later, a source at Damascus Police Command said that Jaish al-Isalam terrorists targeted the neighborhood of Barzeh with a rocket shell, which fell on the roof of a house, causing material damage only.